Brigitta produces good yields of medium-large size berries with a good flavour and medium sweetness. Often described as being late fruiting, but we find that the fruit usually ripens towards the end of July and can be picked until mid August. It's a vigorous variety, growing to 1.5m (5ft), but is also compact in its habit, so is a good choice where space is limited. Fruit yields from Brigitta can be high with good pollination and it does appear to be more drought resistant than most varieties (but even so, don't let it dry out!). One notable feature of Brigitta is that the fruit keeps extremely well, up to eight weeks or more in a refrigerator and, like all blueberries, it is excellent frozen. Capable of high yields with good pollination.Drought resistant. Keeps well. This blueberry was a replacement for a plant that was bought from another nursery. This time the packaging was very good and the plant robust. All I need to do is wait for the fruit. Yet again Trehane has not let me down, they sent me an amazing and well packaged Brigitta Blueberry. I would recommended this nursery for the care they take of their blueberries. I ordered two of this variety (six in total), and all plants arrived quickly and in excellent shape. I also appreciated the helpful planting instructions included. Many thanks! 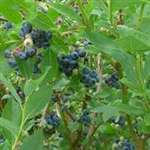 Great to find a blueberry bush that has not been doused in chemicals and pesticides - just what I was looking for. I ordered two varieties and they arrived within a few days, were quickly planted and seem to be doing fine. Although very carefully packaged and secured in place inside the box, quite a few of the flowers had been shaken off, possibly due to the fact that the box would have been lying on it's side. Although this damage was not detrimental, perhaps there would be less if the pots (and plants) were transported 'standing up'. Really well packed and in perfect, healthy condition. A wonderfully looking plant and really pleased with it.